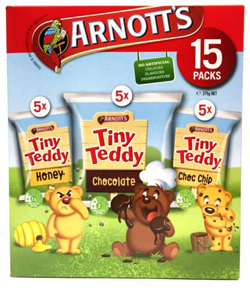 Assorted Arnott's Tiny Teddy biscuits, consisting of 3 Honey, 4 Chocolate and 3 Chocolate Chip biscuits. Great fun for both children and the childish adults! Wheat Flour, Sugar, Palm Oil (Contains Soy), Honey (5%), Butter (Cream (From Milk), Salt), Vegetable Fibre, Salt, Emulsifier (Soy Lecithin), Baking Powder, Natural Flavour.